In a way it is somewhat difficult to be really critical of a game which at least tries to implement a reasonably fleshed out moral system. 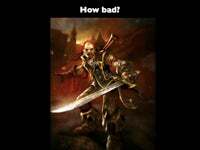 Molyneux: “[In] Fable 2 there is much more colour to those choices: purity versus corruption, cruelty versus kindness, greed versus generosity. And then we play around with those moral choices. We want people to play as themselves rather than deciding to be good or evil.” The choices made are reflected in the player’s, the dog’s appearance, the world design and the way in which NPCs react to the main character. However, and this is my main problem with the game, it is not clear which ingame actions result in any of the world’s/NPC’s reactions .... Because there is a mix of major and minor moral decisions, it is not clear what the results of my actions are. My guess is that I took the game’s “good path”, because the city’s inhabitants seem to like me. But what made them like me? I don’t know. I raised prices 40 percent on all goods, I stole a lot of their stuff, I kicked a bunch of chickens all over the city square, and I married two women at the same time from the same town (one being a prostitute).